Frankincense promotes healthy cell regeneration and supports existing cell and tissue health. An ancient anointing oil that helps overcome stress. Sandalwood helps one to concentrate, relax the mind and relieve stress. It activates our chakras and makes their functioning and coordi- nation with each other much better. 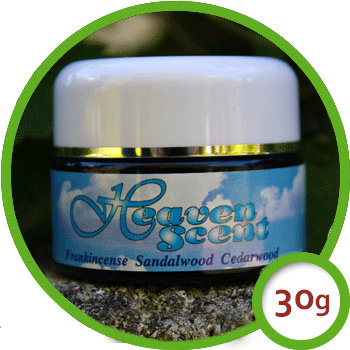 Cedarwood strengthens a weakened spirit, releases toxins out of the body and has been used since ancient times by Tibetan and Egyptian civilizations. Directions: Place the Heaven Scent over the area behind the thumb allowing the whole body to receive maximum effect though the bodies energy points.